This is a short, but important post. I have made a flickr group to upload all of the projects you have made with any of my patterns or tutorials! I like to see the way you are using the fabrics and colors. It is additional inspiration for me. Sewing mug rugs I found that they are great projects to learn different type of binding. This one is very similar to classical look. 1. Cut the backing 2 inches wider and 2 inches longer than the top. Lay the trimmed top with batting on the backing and pin. I have quilted top and batting together. 2. Fold the backing to the edge of the top and iron. 3. Beginning from shot side fold once more and pin. 5. Fold the long side . 8. Repeat with all corners and began sewing carefully. When reach the corner leave the needle down position and pivot. 9. Stitch all perimeter this way. Note that you can use this method when binding quilts, too. If you need a binding wider than a quarter inch this is perfect way to do. Simply trim the backing more than 1 inch. 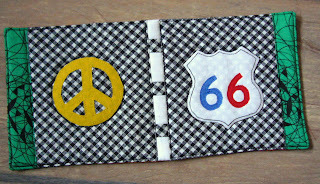 For best result - double the width of the binding you want to have and trim the backing. "Well it winds from Chicago to L.A. This is mug rug inspired by Route 66. It is like the real road with roadways, broken line and real sign. 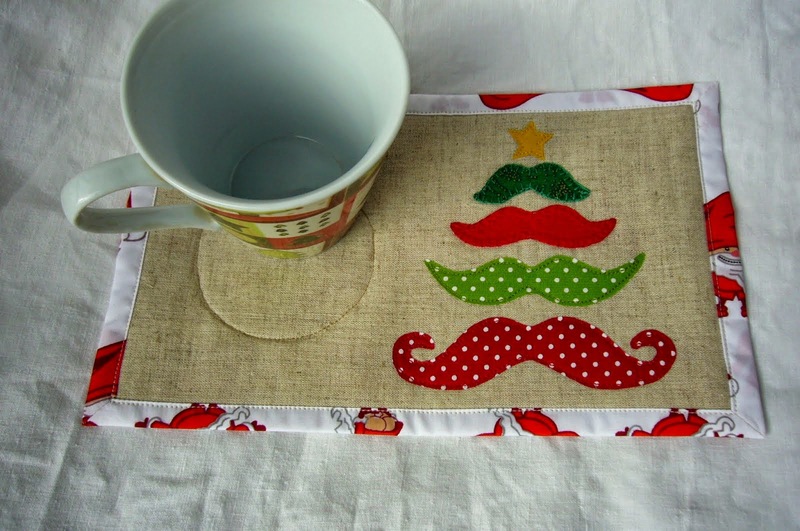 I have always wandered if a man wants to have a mug rug how he will likes sweet embroidered mug rugs that are usually made. That's why I have designed this mug rug specially for men. Your fathers, your husbands, your brothers, your friends. All men that remember the hippie movement and the hippie sign. I have chosen a colorful backing - as a rainbow. It turned out more beautiful than I expected. Pattern is on ETSY or CRAFTSY as usual. This mug rug could be purchased HERE. Do you remember my post and my words about dog's family. I haven't forget, but like in real life it is needed some time for the babies. And he is here - cute small puppy with pampers and bib sitting on a cushion in front of a table and eating from a cup. And hope you love him, too. Grab the pattern from ETSY or CRAFTSY shop. You like it, but can't sew. Don't worry I offer it for sale HERE. 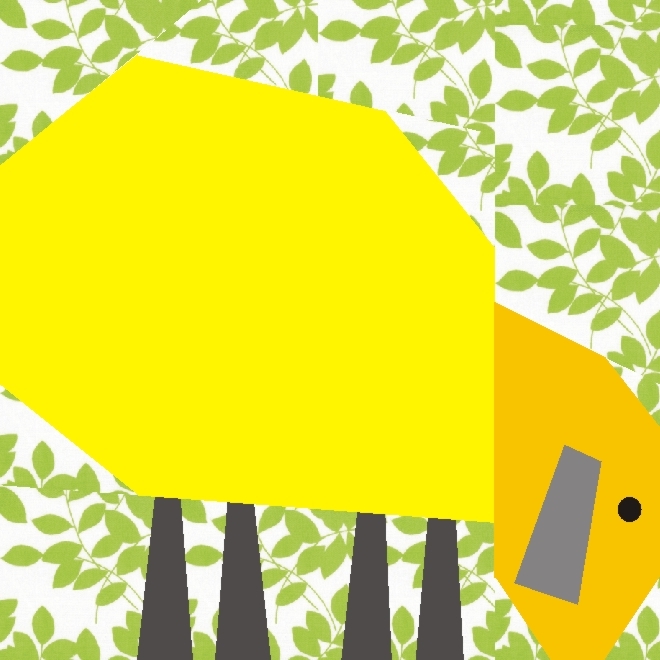 Do you remember how we made paper cutting when we were children? Folding a sheet of paper accordion-style, drawing a shape, cutting, unfolding and voila! We made Christmas' garlands, strips of flowers, lanterns etc. So I designed this easy mug rug Spring Tulip Dance. I have chosen a wonderful fabric with printed tiny flowers and for the top I arranged some coordinating solids. If like it you can get the pattern from my ETSY or CRAFTSY shops. If want to buy a finished product simply visit my shop. As you know English is not my native language so I asked my American friend Elnora for editing the finished pattern's description. She is amazing and made editing within some hours. You can see what she create at her Flickr account HERE. This morning I received an offer from Jan who is blogging at Jan's ART FRIENZY to test my pattern. What was my surprise when received finished block this evening. Such quick response. Look at her finished block. I like her tribute embroidering triangle eyes and mouth. So funny to work with such creative quilter. I usually put circles for eyes. 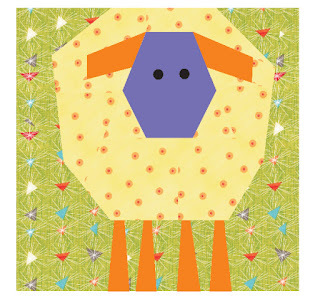 If you are interested in Spring lamb pattern you can find it at my shops. CRAFTSY or ETSY, wherever you have an account. Don't forget to go through other sheep and ram. I couldn't resist myself to share with you what have made wonderful Linda form Lawson place. She accept my offer to be a tester of the pattern Pasture sheep. She said "very easy to make one hour with choosing fabric printing off pattern and sewing "
Amazing blocks. I like both of them. The grey one is like a curly sheep. 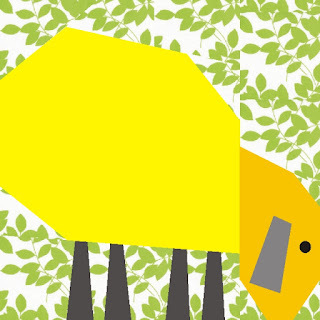 The yellow one pastures a green grass. You could find this sheep and more in my CRAFTSY shop. Wait for more offers to test my next designed patterns. I have designed some new patterns. I need testers for them. Please leave a comment here or send me an e-mail. I will connect with you. Basic paper pieced skills are needed. The pattern is beginner level. 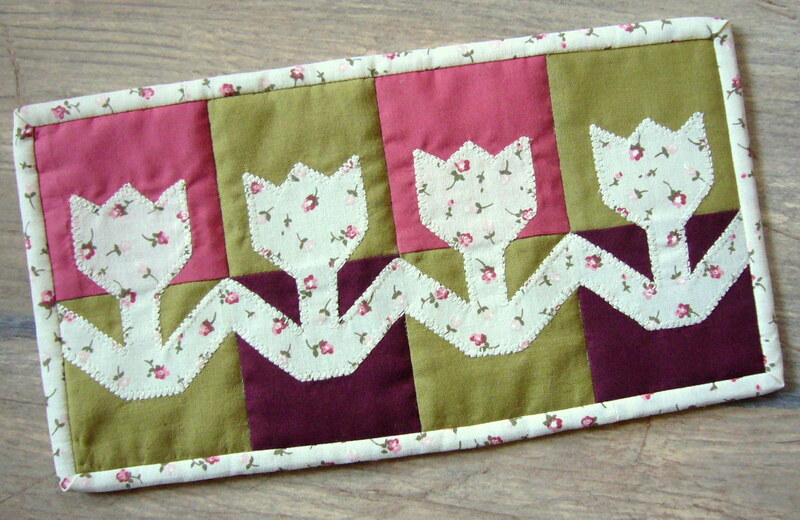 Great for Easter table runner, mats, coasters, etc. The finished block is 6 inches square, but there is a percentage table for changing the size. 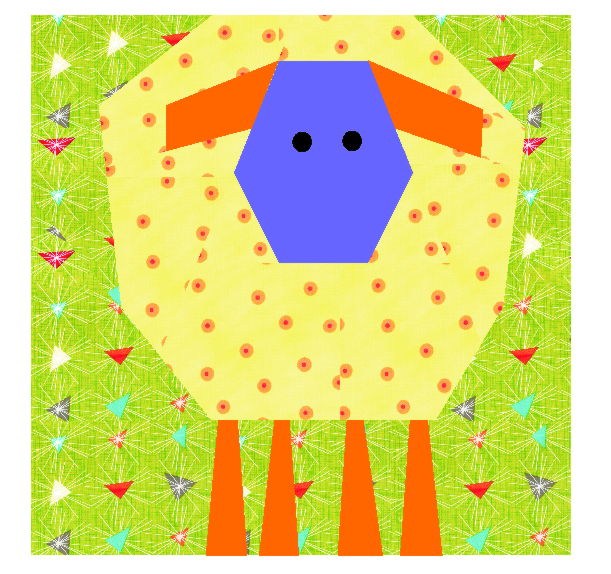 More sheep' patterns you can find here. I am satisfied! I have finished the baby quilt CIRCUS TIME! As you know I have started designing last year and this year in February after some days of wandering how to quilt the baby quilt it is finished. Here it is in all its beauty. The back is interesting, too. I collected all colorful pieces left and white rests from sashing, stitched them together , rotate alternate squares and voila. Here you can see the quilting better. I have chosen the most simple way for quilting because there are too many colors on the top. For the binding I have chosen a lovely fabric In the Dog House White Be a Star from Fat quarter shop. It is one of the fabrics from my Christmas present - I love it. You can read more and get the pattern for the blocks in my CRAFTSY shop.